In 1957, Sidney Nolan moved to a river frontage house at Putney in London. The muddy tidal reaches of the Thames began to influence his palette and, utilising a new medium of fast-drying polyvinyl acetate mixed with dry pigments, he began to scrape and pull the paint in thin layers across the surface of the board with a squeegee. 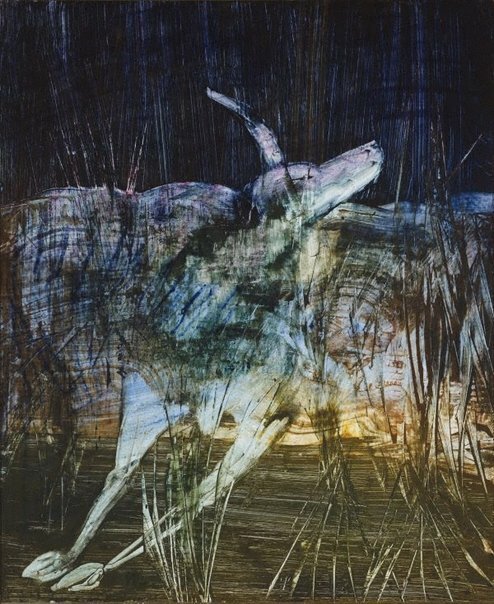 Still fresh in his mind was a recent visit in 1955 to Greece, where the stories of the battle at Gallipoli and the ancient myth of Leda and the Swan became new obsessions and resulted in a group of drawings in ink and crayon. These later informed the series of portraits based on the Gallipoli tragedy and the darkly haunting paintings of Leda, which he embarked upon during his Harkness Fellowship residency in New York in 1958. Memories of forms gliding on the Thames were evoked through the slick texture of the polyvinyl acetate, allowing figures to realise themselves within the medium like apparitions haunting the watery landscape. 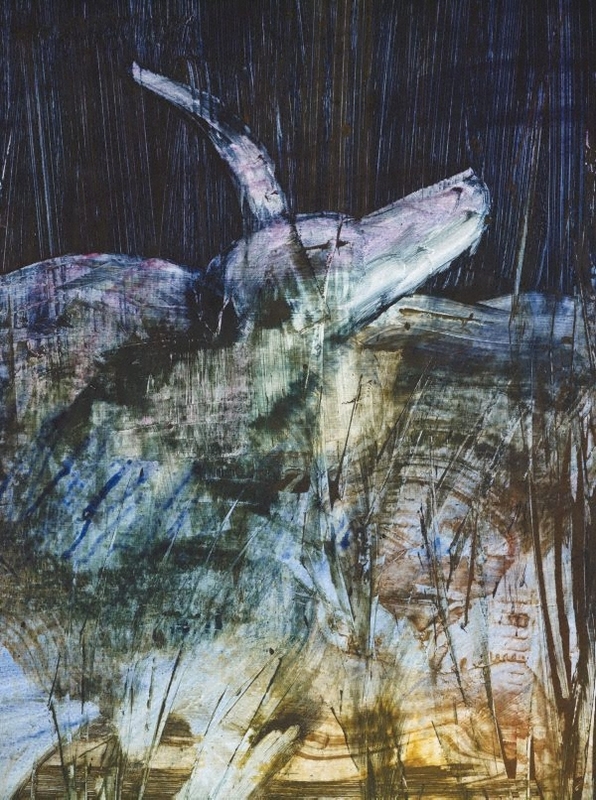 'Animal in swamp' was first exhibited at Durlacher Bros Gallery in New York in 1958 and included in Nolan's first retrospective, held at the Art Gallery of New South Wales in 1967. Signed l.l. corner, brown/green polyvinyl acetate paint "n". Not dated. Max Harris, Art and Australia [series 5, vol. 1, no. 4] , 'The art collectors 1: Kim Bonython', pg. 226, Sydney, Feb 1964-Apr 1964, 226 (colour illus.). Look , 'Lost boys from the bush found in the city', pg. 10, Sydney, May 2015, 10. Arts , 'In the galleries', New York, 1958, 57.